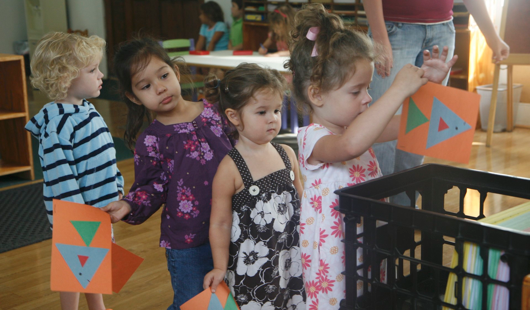 Montessori is a child-centered educational approach that addresses the holistic development of children. At the center of its philosophy is the belief that all children naturally want to learn and, given the right environment and opportunities, can teach themselves. Thus, the focus of a Montessori school is to provide that perfect environment and give children well-designed tools so they can explore any number of topics on their own. With gentle guidance from a well-trained Montessori teacher, children are allowed to develop at their own pace and to cultivate their natural love of learning in a non-competitive environment. Montessori students learn how to learn and, more importantly, develop self-motivation and self-discipline to meet challenges with grace and confidence. To learn more about Montessori, please visit the websites for the American Montessori Society (AMS) and the Association Montessori Internationale (AMI). The goal of both Montessori and traditional schools is the same: to provide learning experiences for the child. The biggest differences lie in the kind of learning experiences each school provides and the methods they use to accomplish this goal. Montessori educators believe these differences are important because they help shape how a child learns, his work habits and his future attitudes toward himself and the world around him. 2.Teacher is center of classroom as "controller"
The name “Children’s House” is often linked with Maria Montessori. In fact, she called her first school “casa dei bambini,” which is Italian for “children’s house.” In Montessori circles, “children’s house” represents a school that upholds Montessori’s educational philosophy and honors her groundbreaking work in the development of children to reach their greatest potential.